And done in maybe 20 minutes, most of that time was me digging out scrap paper. Unfortunately, I didn’t take pictures of the bird cages when they were in their prime — their first 5 minutes of existence. No, these pictures were taken last night, after a full week of little girls carrying them up and down stairs, cooing to their birds, twirling their birds, making their birds dance. So while they are slightly mashed and worn, they have been well loved. These were so quick to make and brought such joy to the girls, we might do them again with actual cardstock, which should be a little sturdier than the lighter weight papers we used. Lids of a smaller diameter and lighter would also be helpful. Lincoln was working with Sid and missed out on this project, but Sidney seemed to enjoy it. 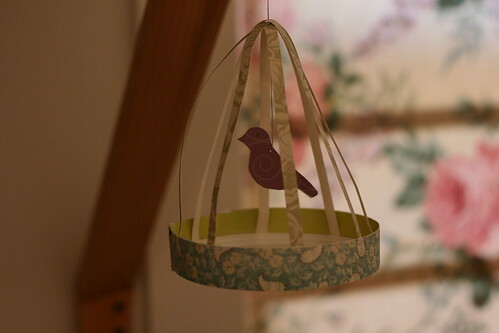 He hung his bird cage from the ceiling fan in my bedroom so Prairie and I watch it dance at our afternoon naptime. 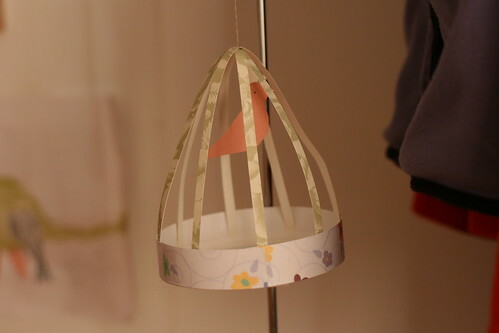 While I did have to thread the string through the bird and cage, the girls got in practice using the paper cutter and cutting out the bird with scissors, so it was a nice mom/child joint project. For better pictures and detailed instructions, go to The Bride’s Cafe. Great idea for a craft! I looked at your source and we made a few tonight. Did you have a small hole punch to do these? The 1/4 inch strips were too small for us to punch so I had to make them 1/2 inch instead. I used coffee lids. (The lids that fit disposable coffee cups) It worked nicely. My sister had just given us lots of 12 inch scrap book paper which was the perfect size for this craft. Nope, no hole punch. We did 1/4 inch strips and I just threaded a needle and used that to punch a hole through my bird, pull the thread through and needle-punched holes through the paper strips and pulled thread through. The instructions at The Bridal Cafe has you knotting the thread about 1.5 inches above the bird so it hangs down at the right height and holds the bird cage ceiling above the birdie’s head. So I don’t think the hole punch and brad thing were necessary.